There are no important economic reports in Australia however the US is publishing SM Manufacturing PMI soon. 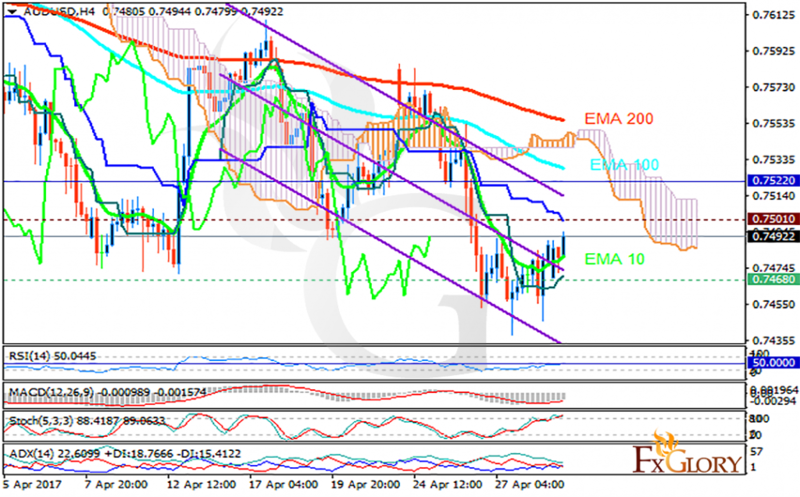 The support rests in 0.74680 with resistance at 0.75010 which both lines are below the monthly pivot point at 0.75220. The EMA of 10 is moving with bullish bias but it is located below the EMA of 100 and the EMA of 200. The RSI is moving on the 50 level, the MACD indicator is in negative territory and the Stochastic is in high ranges. The ADX is not showing any clear signals. The price is in the Ichimoku Cloud and above the Chinkou Span. The Tenkan-sen is showing an upward trend while the Kijun-sen is showing a downward trend. There are mixed indicator signals for this pair, therefore traders can wait for better signals.